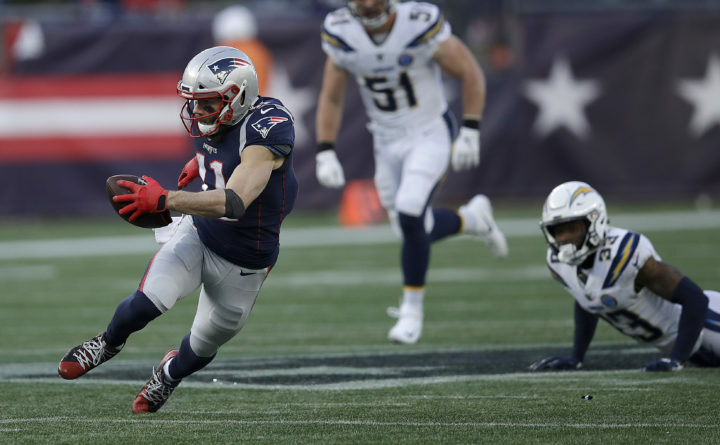 New England Patriots wide receiver Julian Edelman (11) runs after catching a pass against the Los Angeles Chargers during the second half of an NFL divisional playoff football game Sunday in Foxborough, Massachusetts. NEW ORLEANS — It just had to be this way. And now, it is this way. In an NFL season that has been all about offense, the league’s four scoring machines are left standing. The sport’s four divisional playoff games this past weekend were relatively short on drama and bereft of upsets, as the top two seeds in each conference won at home on the heels of their first-round byes. But while the weekend was lacking in great football theater, it did produce the most fitting outcome. The NFL’s four highest-scoring teams from the regular season will play in Sunday’s conference championship games. The Kansas City Chiefs will host the New England Patriots in the AFC and the New Orleans Saints will be at home against the Los Angeles Rams in the NFC, with spots in the Super Bowl two weeks later in Atlanta at stake. Brees was being kind. No one will want to talk very much this week about the defenses of these four teams. The Chiefs, Rams and Saints each scored more than 30 points per game during the regular season, making this only the fourth season in league history — following 1948, 1949 and 2011 — with a trio of teams topping the 30-points-per-game mark. The Patriots were fourth at 27.2 points per game. It is indicative of how the game is now played. The 1,371 touchdowns scored league-wide this season were the most in a single year in NFL history. The 11,952 points scored were the second-most ever. This season saw a confluence of factors — from brilliant quarterbacks, young and old, to innovative offensive systems borrowed from the college game to rules tilted unabashedly in favor of offenses-turn games into wide-open scoring-fests. Improved TV ratings suggested that fans approved. Defense-first teams like the Baltimore Ravens, Chicago Bears and Dallas Cowboys reached the playoffs and, at least at times, looked capable of crashing the party. But those pretenders are gone. It’s all about who can score the quickest and the most. Both of Sunday’s games will be rematches of highly entertaining regular season affairs. The Saints beat the Rams, 45-35, in early November at the Superdome. The Patriots topped the Chiefs, 43-40, in mid-October in Foxborough, Massachusetts. Much was made of the fact that none of the NFL’s six highest-paid quarterbacks reached this season’s playoffs. Even so, there is plenty of quarterbacking star power remaining for the season’s second-to-last Sunday of play. Brady and Brees are all-time greats. The Chiefs’ Patrick Mahomes is this season’s likely league MVP in only his second NFL season. The Rams’ third-year pro, Jared Goff, has become an honest-to-goodness franchise quarterback in his two seasons under Coach Sean McVay. As the Patriots play in an astounding eighth straight AFC title game, Brady returns to the site of one of the low points of his career. The last time the Patriots played in Kansas City came in Week 4 of the 2014 season. Brady played horribly and was lifted by Coach Bill Belichick for then-backup Jimmy Garoppolo. The Patriots were overwhelmed, 41-14, on “Monday Night Football” to prompt speculation that Brady was all but done and would be eased out of the starting job in favor of Garoppolo. That, as it has turned out, was three Super Bowl appearances (and two Super Bowl victories) ago for Brady and the Patriots. Brees said he sensed when the Saints faced the Rams during the regular season that a postseason rematch might be in store.